Here are some more Blood Angels Tactical Marines for you, pilfered from the Betrayal At Calth box. As with their predecessors, these chaps are well-weathered and battle-damaged. 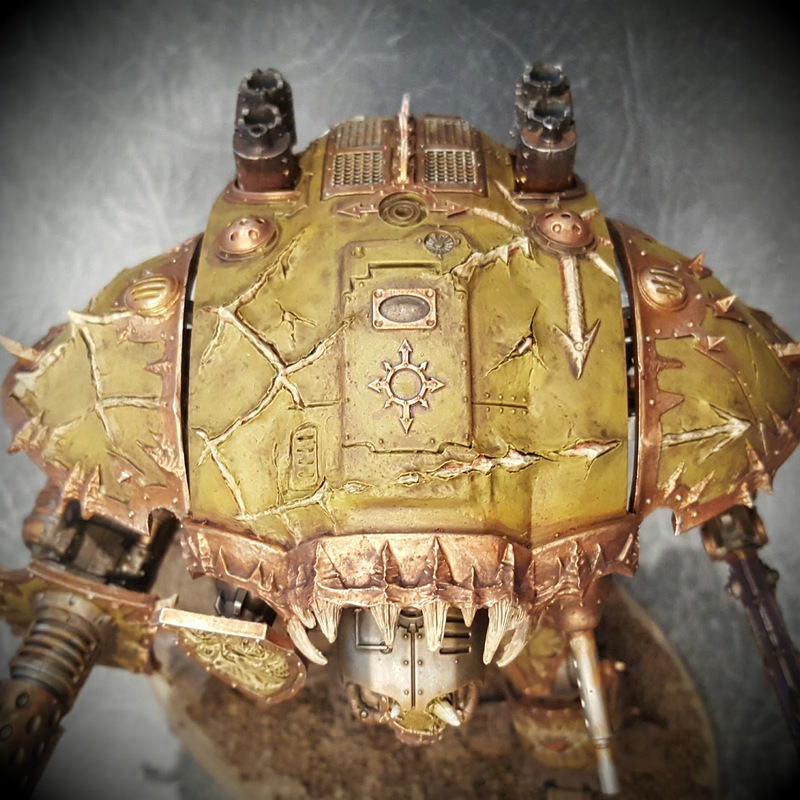 The glazed blood drop is the recurring motif for my army, and will be the motif of my Successor Chapter, the Scions Of Sanguinius. For the Plasma Gun, I used a different technique to usual, and used layers of grey with a Biel-Tan Green wash over them for the power coil. it works pretty well, I think, and complements the lenses on the helmet. 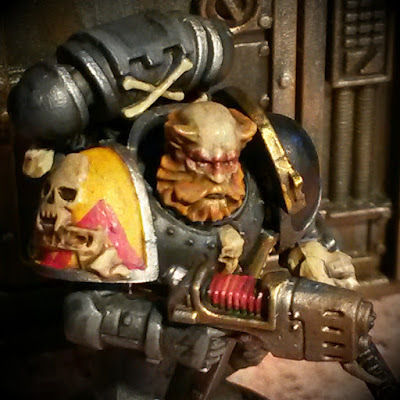 I have taken the time whilst doing up my Tactical Squad to revisit my kitbashed Captain that I did a while ago. I repainted his angel wings black, and made the gold colours bolder and less brassy. Once again, I think it works pretty well, and it ties him in with the grunts. Previously, the blood drops were purple, as well, so revisiting him allowed me to bring that in line with everything else, as well. Bonjour! Long time, no see! 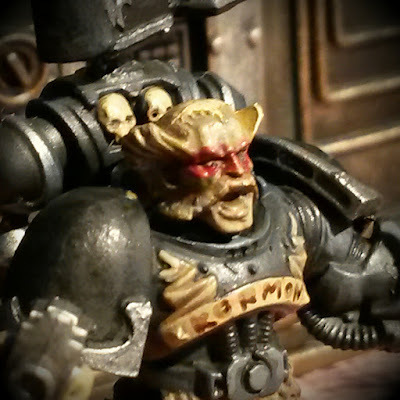 It has been a long time since I posted anything here, which has been down to a number of different factors - a mini-Primarch, a trip to Japan and Christmas have been the major ones - but I am finally trying to get back into my hobby groove by revamping my Scions Of Sanguinius Second Company. Whilst the Veterans of the First Company (or some of them, at least) featured last year, and are crisp and shiny, these guys will be a lot more rough around the edges, and will all be encased in venerable MkIV Power Armour (courtesy of the BaC box set and some Blood Angel Upgrade Packs). I have continued using the Vallejo Fire Red as a base colour, with Citadel Jokaero Orange for highlights. 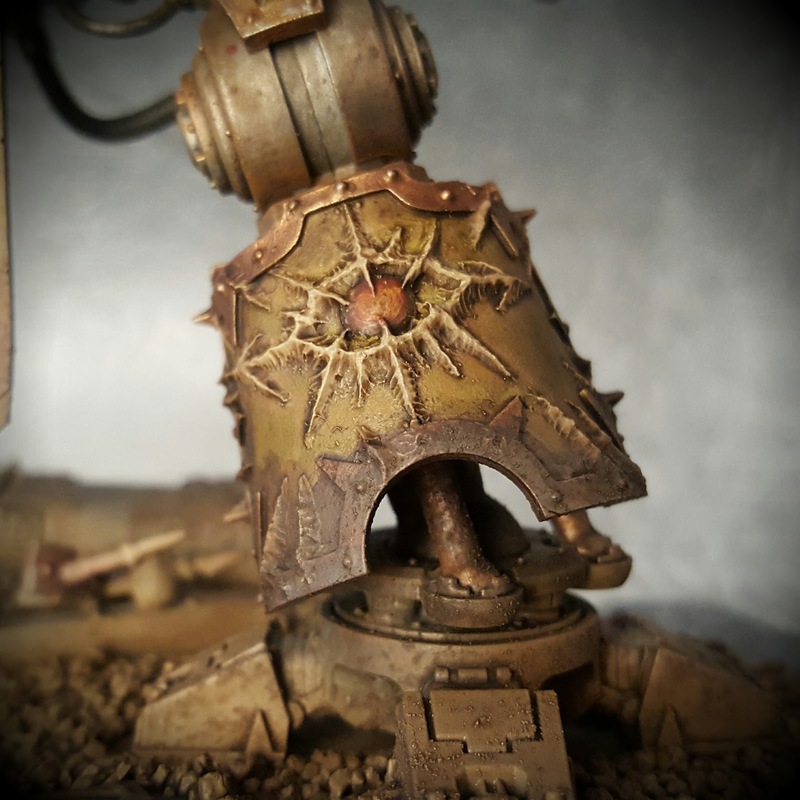 This time, though, I have decided to water down my Agrax Earthshade so that it doesn't overpower the miniature. I really like the BaC Tactical Marine set. The details are crisp and clear, and the reinforcements on some of the greaves and shoulder pads is reminiscent of the Rogue Trader era stuff. I approve. For my Second Company, I am going to work on two basic five-man Tactical Squads to start off with, along with their dedicated transports (interchangeable Rhino/Razorbacks), and then pad that out with an Assault Squad and a Devastator Squad to form the spine of a Blooded Demi-Company. I find that the Blood Angel Upgrade Packs have a LOT of treats in them for the price that they are pitched at. 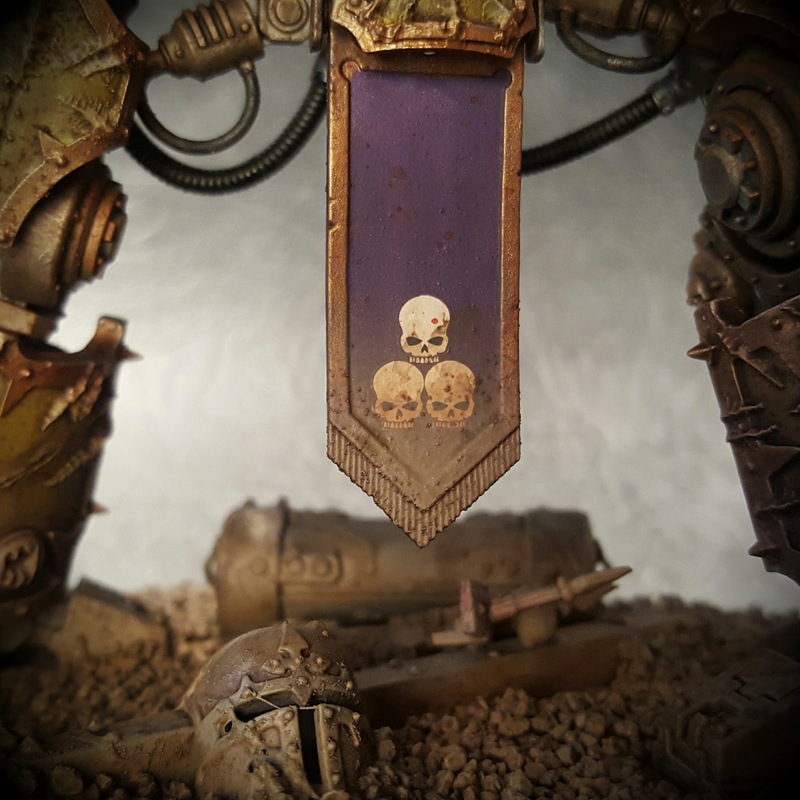 GW are onto a winner with those smaller packs (sub-£10) that allow you to add character to your force. I'd like to see the Space Wolf one. Because I am integrating these guys into an existing force, I opted to mount them on 25mm bases, rather than 32mm bases. 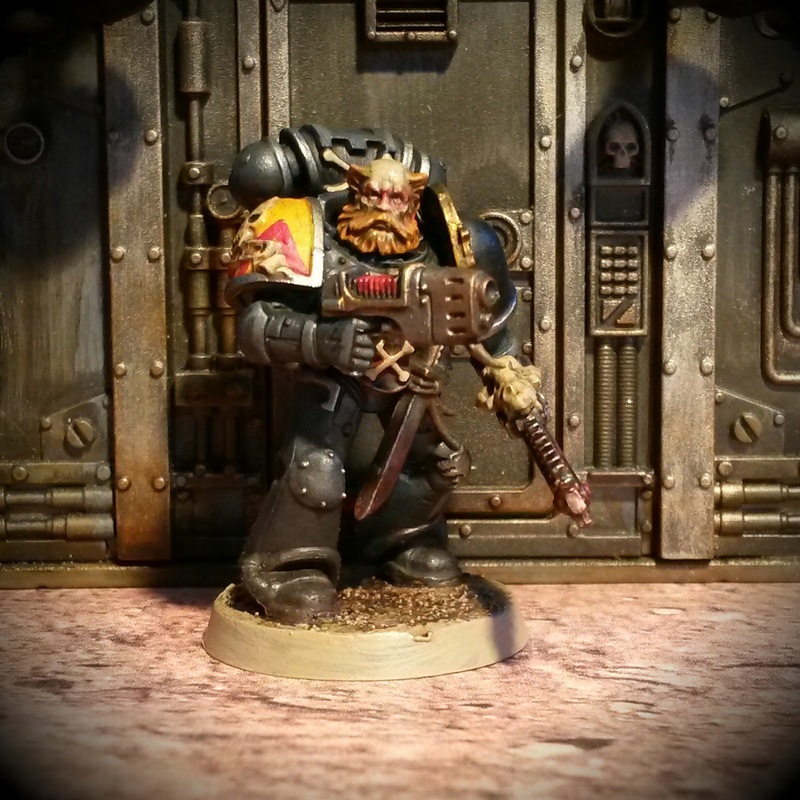 My opinion on the 32mm bases changes from week to week, but I find that 25mm bases are perfectly good enough for Tactical Marines. 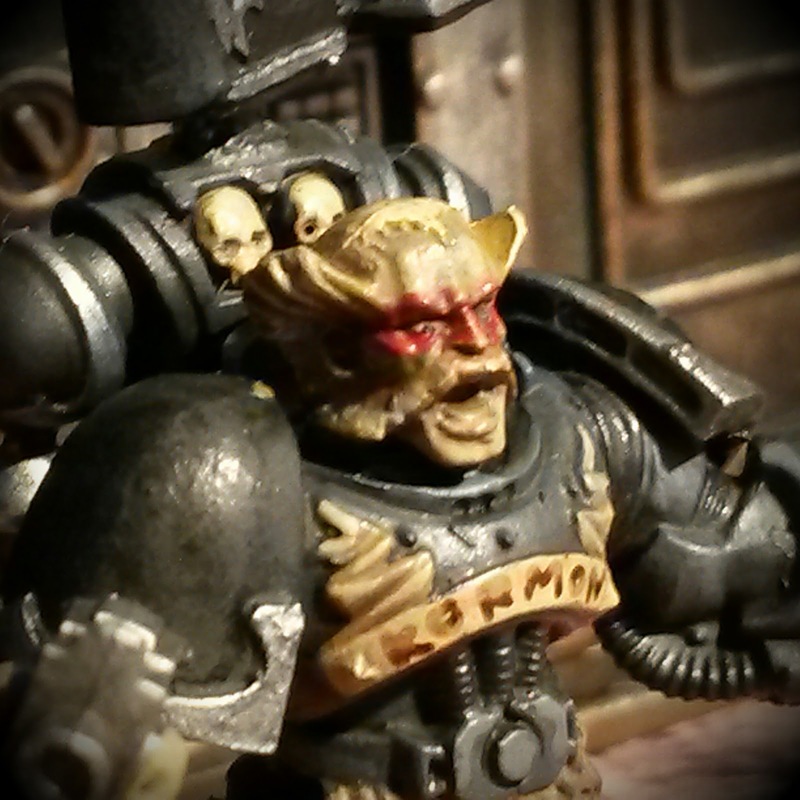 I'm using Biel-Tan Green as a spot colour for the lenses on the Marines, which hopefully contrasts nicely with the Fire Red. Ah! The nostalgia of old, MkIV power packs! These are eerily reminiscent of the power packs that the old plastic Plague Marines used to have. Here my first two Marines are, in all their MkIV finery. I haven't been able to post anything up recently, for a number of reasons: first and foremost being that I have been constructing a lot of the old kits that I have had lying in boxes for ages, in readiness for the weeks and months ahead. Like a squirrel preparing for winter, I have been constructing vehicles and then burying them away in KR cases. One thing that I have been able to paint, however, is my Chaos Knight! And I must say, I'm glad that I have done it now. 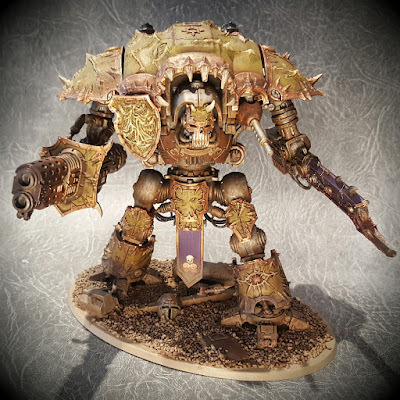 This is the FW Chaos Knight kit - not a conversion - although many of the conversions I have seen on line are much cooler - and as such, there was a high percentage of resin involved in the model. 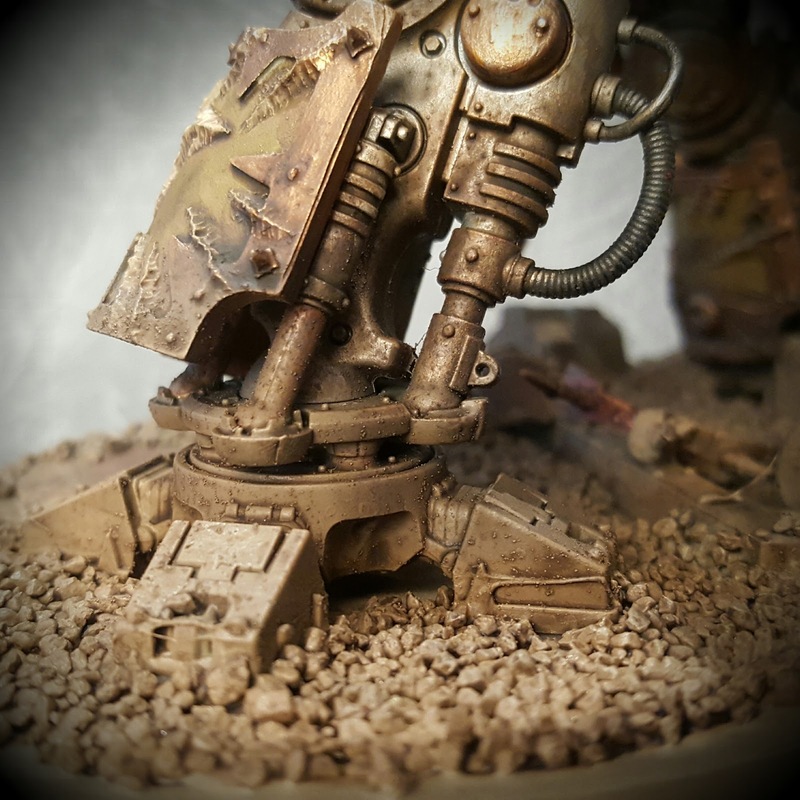 I don't like resin. Not necessarily because of the material itself, but rather the moulding process that means you have to use a razor saw to cut things off their gates and such. There is also the fact that you have to rely on superglue, rather than plastic glue, and with big, centrepiece models, there is always that fear that they could be easily broken. 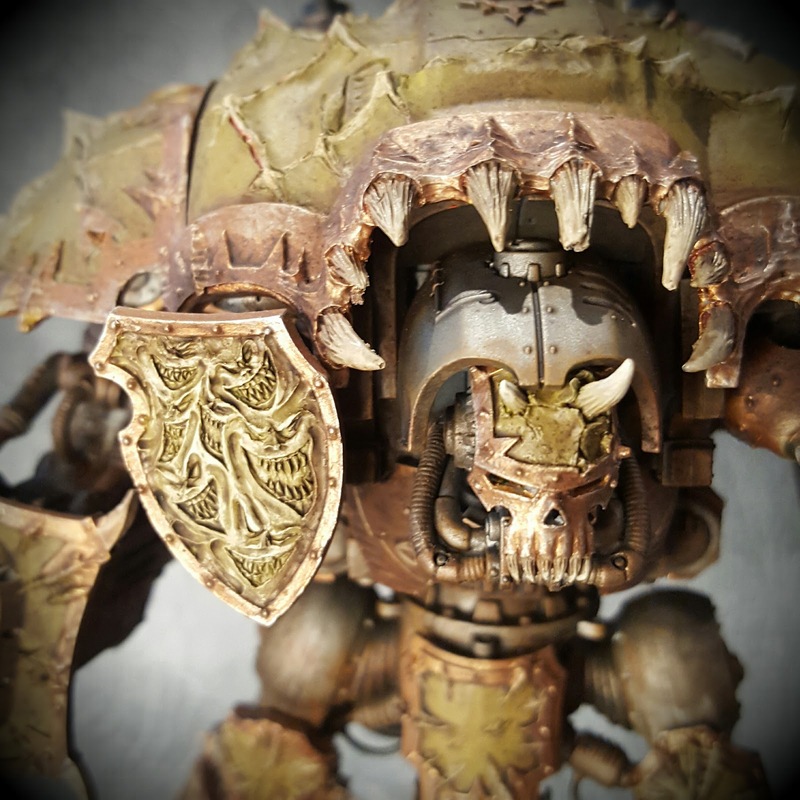 I really enjoyed painting this guy, once I had overcome my fear of the resin. 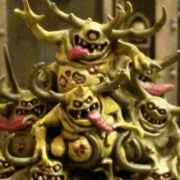 I'm not sure how much I would have enjoyed painting it if it was dedicated to one of the fussier gods, like Tzeentch, but Nurgle allows for a sloppy paint job. A lot of rust, dirt and mud has gone onto this model, and at times I wondered whether I should perhaps have just painted him entirely brown... But I think it worked out in the end. I opted for the Thermal Cannon in the end, because... y'know... 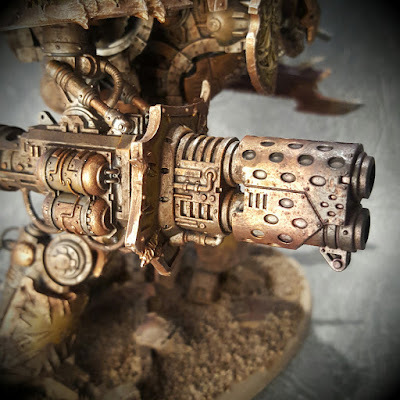 Thermal Cannon. 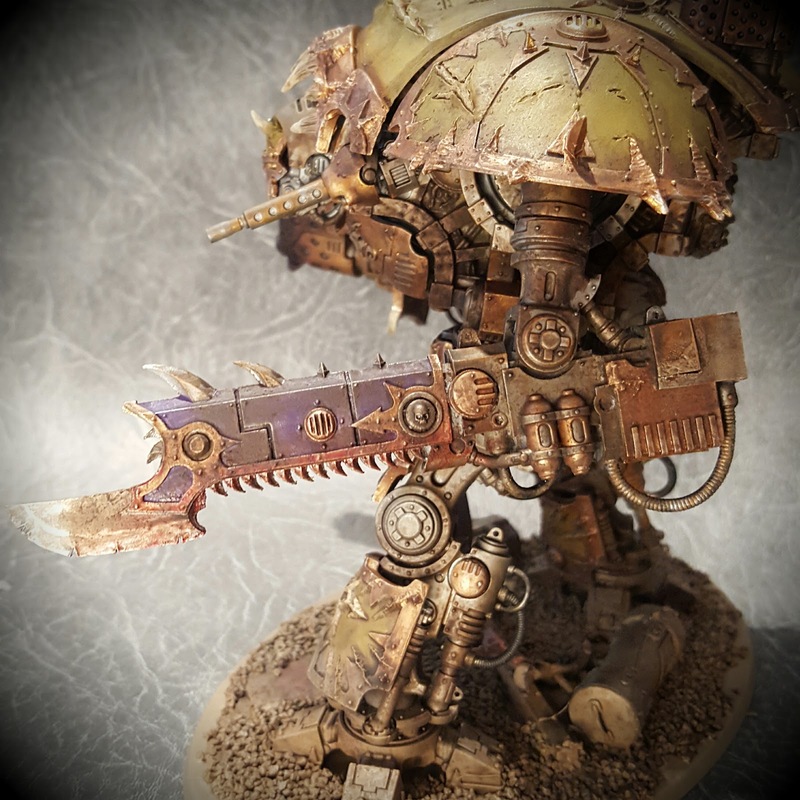 The Foereaper Chainsword was made entirely out of resin, which was generally fine, except for the interlocking mechanisms - otherwise known as the important bits - which were warped and/or needed heavy trimming. I got there in the end, mind. 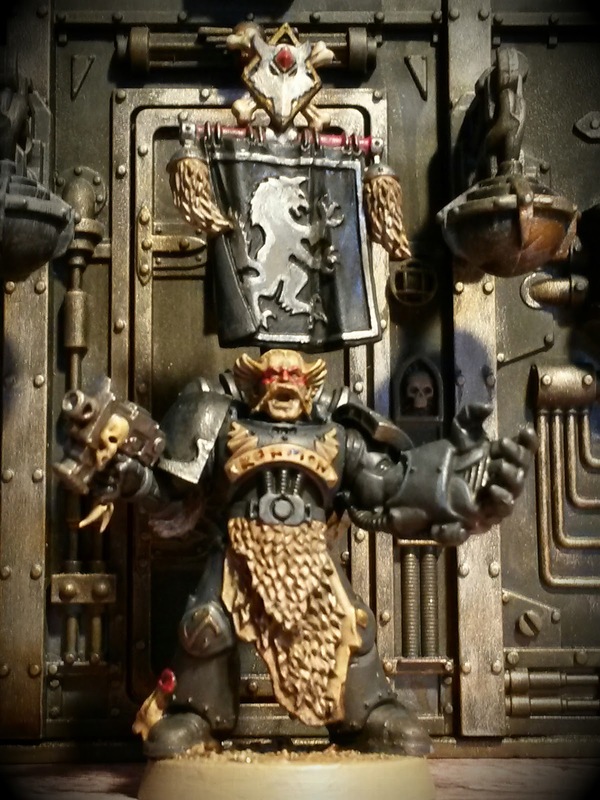 I now have a centrepiece for my Sons Of Entropy Chaos Space Marines army! Excelsior! RRRRRAAAAARGH! They are complete! 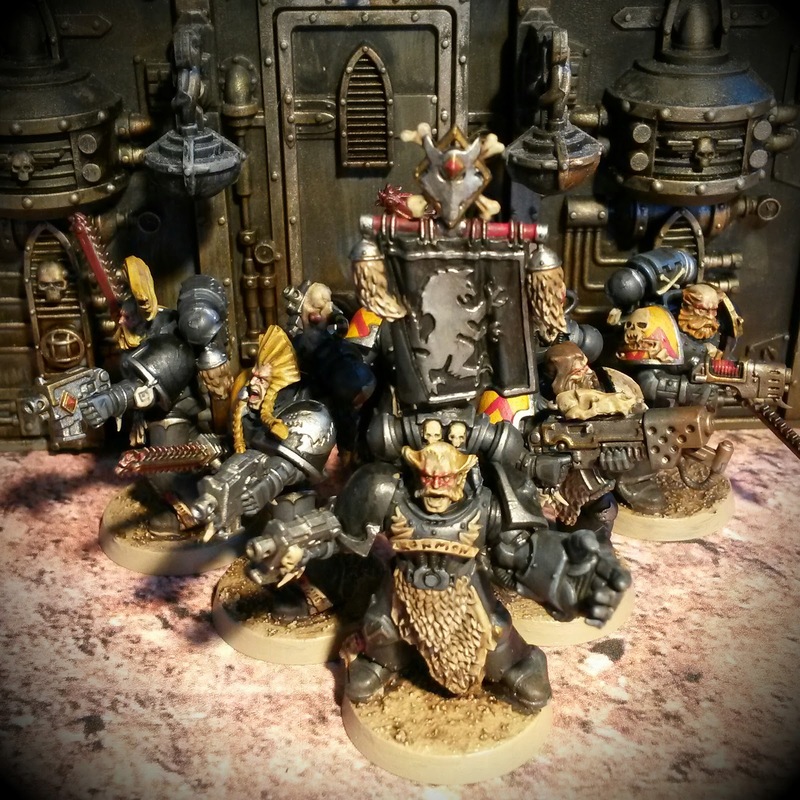 The second batch of Blood Claws are now ready for battle, which means that all of my infantry are painted in anticipation of my showdown with the ruinous powers next weekend. Here is my Wolf Guard Pack Leader, who looks more than a little like Windsor Davies from the Carry On films. 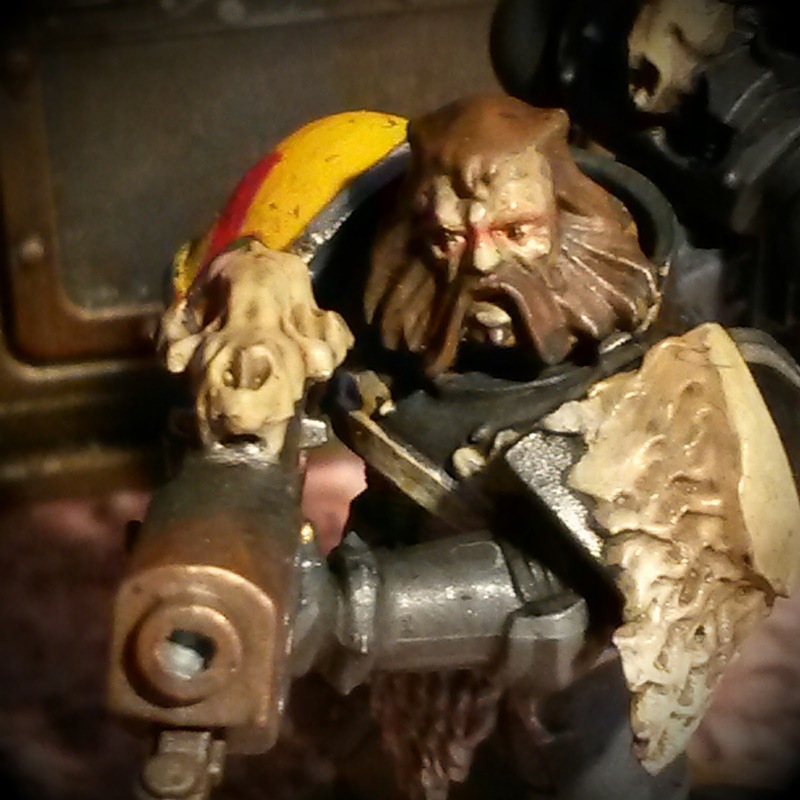 Once again - as with my last WGPL, he is brandishing a Power Fist for a bit of added Oomph. I cobbled this chap together a looooooooong time ago, and I can only assume I was trying to arm him with a Combi-Flamer or somesuch... I will be using him as a Flamer-wielding Blood Claw. He's quite owlish, I think... His hair reminds me of Night Owl from Watchmen, which is not the coolest look, if truth be told. Here's a gruff soul, wielding a Plasma Pistol. One of my favourite things about the new Space Wolf Codex is the ability to trick out even the smallest unit with a few special weapons. 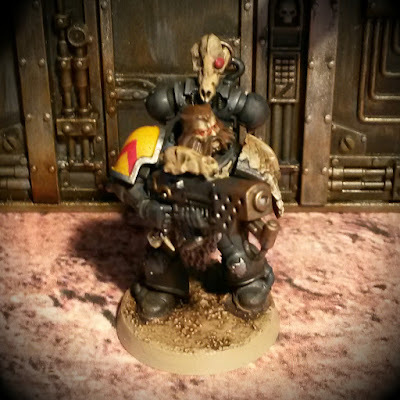 Blood Claws can swap one of their Bolt Pistols for a Plasma Pistol and still have a Special Weapon (such as a Flamer) in a squad of just five men. It means they can quickly get expensive, but they are a lot more effective.